Shark Tank returned Sunday, January 27 with a double-header of new episodes. 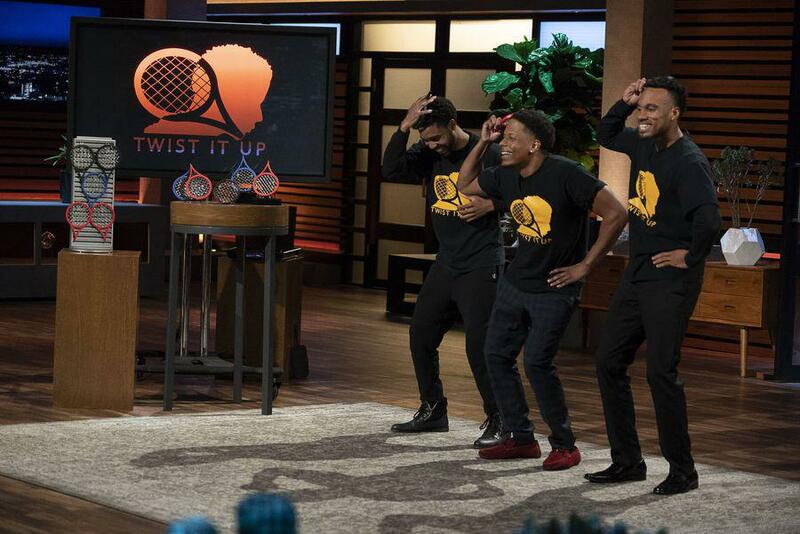 For episode 12, they stuck to a classic Shark Tank panel with Lori, Mark, Daymond, Robert, and Kevin. The products ran the gamut of typical Shark Tank pitches: something in pets, something in food and wine, and something in grooming products. The outlier was a lively and at times contentious pitch and negotiation for a children’s education program. I’ll post a recap of the second episode (number 13) tomorrow. The Pitch: A car seat for dogs. A secure dog carrier that works as a backpack easily clips onto a strap you leave attached to the backseat of your car. Their selling point is the safety that it offers your pet in the car. The Negotiation: After the pitch that elicited laughs from all the sharks, they get down to peppering the business duo with questions. Unfortunately, Juls and Carolyn don’t have the numbers about dogs injured in car crashes that Mark is looking for, and this concerns all the judges. Juls tries to pivot, citing a new law in Great Britain that penalizes dog owners who drive without safely securing their pet to justify the need for their product. Kevin thinks their international distribution is unnecessary and he pulls out along with Robert because they don’t believe in the product (or the one million valuation). Lori, Daymond, and Mark quickly leave shortly thereafter citing mismanagement in marketing and the complexity of the product. The Pitch: Wine for the casual consumer with labels that explain the flavor notes and more about the wine. The Profits: We didn’t get clear numbers, but he has made $100k in wholesale to date over the past six months. The Negotiation: The sharks all love the wines and Kevin, in particular, is pleasantly surprised by the taste. His notorious snobbery about wine is of no use to him, however, as this brand of wine is specifically aimed at the casual consumer, and is not looking to be associated with “luxury” brands of wine. The sharks are distracted by Kevin and spend more of the pitch roasting him than they do asking questions. Robert wants to know what Brice will use the money for, and luckily he has a plan ready to go. He intends to hire salespeople to help get him into larger scale retailers. Kevin pulls out because he’d be competing with his own businesses, Daymond is next to fall because he doesn’t want to take on the challenge of building a brand in the wine business. Mark pulls out for reasons unknown, but he claims it’s because he won’t invest in a company that uses a mime in the pitch (strange). Lori meanwhile wants to invest because she thinks her target demo is perfectly suited for the product. She offers $150k for 12.5% which all the sharks think is an “automatic yes” deal. He counters with $150k for 7.5% to maintain his valuation that he raised other rounds on, but she won’t take that little. He recognizes this and adjusts his counter to $170k for 12.5%. It’s rare that they adjusted the amount of money instead of the equity in the negotiation, but it works with Lori lowering him to $160k for 12.5% of the business. The Pitch: A hair styling tool for people with afro-centric hair to style their hair with no chemicals or pick. The tool looks like a miniature tennis racket with no handle and fits in your pocket. The Profits: First year he did $95k and then after a change in marketing he made $101k from January-April of the new year and is projecting over $500k in revenue this year. The Cost Breakdown: It costs $3.50 to make and retails for $29.95. The Negotiation: All the sharks are enamored of the presentation and you can tell right off the bat someone is going to give him an offer. After explaining the issues he’s had with his manufacturer and specifying that this is where he needs the most help, the sharks all realize that they could help him with their manufacturing relationships. Mark is given pause, however, when he can’t answer simple questions about how much profit he made or specific numbers because he only very recently hired an accountant. Robert drops out because he doesn’t understand the product. Daymond decides he’s going to make an offer after learning that Noel is in talks with Sally’s and CVS to take to shelves. He says up front that he’s interested in licensing the product and therefore any deal would be contingent upon a securing a licensing deal. Pending acceptance of those terms, he’s willing to offer $225k for 25%. Lori begins to pitch herself, but as she does we see Mark quietly consulting with Daymond. They interrupt Lori’s pitch to make a new one of their own. Daymond and Mark will give him $225k for 25% so if Daymond can’t get it licensed, Mark will help with the manufacturing problems in China and take the product and full equity. Noel excitedly takes that deal. The Deal: Daymond and Mark split $225k for 25% of the company, Daymond’s involvement contingent on a licensing deal. The Pitch: A learning subscription box for children ages 0-6 to aid with development. The learning program is for parents as well with weekly lesson plan type explainers to help them maximize the learning potential of the toys they send. The subscription service sends 6 toys every three months along with the parental content. The Cost Breakdown: Costs $120 to make the content and toys for each three-month cycle, retails for $297 per cycle.
. He offers her a $200k for 10% with the implication that he will join the board of the company and steer the company in the right direction in exchange for that much equity. Kevin also wants to invest because of her strength as a personality. He structures his offer much differently: $200k for 2.5% and a royalty of $10 a unit until he gets $200k back, then the royalty drops to $2.50 a unit until he gets another $600k and then the royalty disappears. She doesn’t like the royalty caveat and counters Robert, asking him to consider 5% equity. He says no, so she turns her attention to Kevin asking him to consider giving more money for more equity with no royalty. He rejects that because he thinks she needs an incentive to pay him back. Hearing that, she returns to Robert asking him if he would accept a deal structured in 5% of the company and 5% advisory shares. He says that he doesn’t care how she structures it as long as he gets 10% and it looks like everyone is going to leave happy as he closes his notebook about to stand up and make a deal. Unfortunately, Zara demonstrates exactly what the sharks accused her of—not knowing when to stop asking for more—and tries to get Robert and Kevin to come in together. This act elicits groans and loud criticism from the sharks; ultimately infuriating a usually perpetually calm Robert because of the disrespect it shows him. He correctly points out that not understanding the limitations of things is why she has failed thus far and that he can’t work with her after that. Realizing what a precarious position she’s in, she turns to Kevin and accepts his deal, making a point to emphasize that she recognizes the value Kevin brings to a company. The Deal: Kevin invests $200k for 2.5% of the company and a royalty of $10 per unit until he recoups his original investment and then drops to $2.50 per unit until he makes an additional $600k after which the royalty will end.